Kristin Halldorsdottir Eyfells has an overwhelming passion for life. It has been her sharp intelligence and penchant for laughter, paired with the candor of her interests and experiences are as varied and colorful as the hues which comprise the images on her canvases. Although she has been painting for many years, she never intended to become an artist. She graduated from the Commercial College of her native country, Iceland, and , at the age of twenty-one, opened her own highly successful dress business. For several years she employed up to sixteen women to design and market her fashions. This enterprise lasted well over thirty years, during which time she kept residencies both in Iceland and the United States. As C.E.O. of her own dress company, she constantly commuted between the two countries. Early in her business career, during her enrollment at the Rudolph Schaefer School of Design in San Francisco, she met her future husband, architect and sculptor, Johann Eyfess. Four years later they married and moved to the east coast where Johann had been hired by a large architectural firm. Once settled, she decided to attend Hofstra University in Long Island, New York. Inspired by Johann's dedication to the Fine Arts, she signed up for a sculpture class. This marked the beginning of Kristin's long and prolific artistic career. Some time later, the couple moved to Gainesville, Florida, and she continued her studies at the University of Florida. In 1962 she received a Bachelor's degree in Psychology, followed in 1964 by a Bachelor of Fine Arts. She began to exhibit in 1962, and since then, her work has been featured in more than one hundred exhibitions in the United States and Europe. In part, her decision to paint portraits of famous people stems from her natural sociability and intense interest in human nature. Her subjects range form political figures such as Barbara Bush and Saddam Hussein to actors like Sean Connery and Katherine Hepburn. Kristin only paints people who intrigue her and who have made an impact on the world, regardless of whether the public perceives them as heroes or villains. To create her over-sized, close-cropped portraits, she immerses herself in the life of the celebrity by collecting photographs, reading biographical information, and, when possible, following their careers in the newspaper and on television. 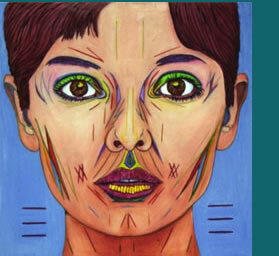 Krisitn's paintings exaggerate and emphasize the facial characteristics that some of her subjects may want to hide. She believes that lines, creases and wrinkles add individuality and personality to a face, and it is that very essence of character which she is intent on capturing and expressing. Using geometric shards of luscious gem-tines, she transforms laugh lines, furrowed brows and crow's feet into red, violet, green and indigo badges of uniqueness. At on point in our conversation, before I could inquire as to the artists who have influenced her, she vehemently declared, "I am absolutely not consciously influenced by anyone!" She is an artist who is neither concerned with fitting neatly into the history of art, nor creating art that is merely pleasing to the viewer. She states that she creates her "faces" because of an inner need, regardless of how viewers respond to the personas she depicts. She goes on to add that she finds unflattering comments just as interesting as those that are admiring. Kristin is one of the most strong-willed and determined women I have ever encountered. She has as much character and vitality as those captured on her canvases. She is an artist dedicated to truth and does not shy away from reality, however unflattering it may be. I admire her because she paints and sculpts, not as a source of income, but rather because she is compelled to create. Meeting Kristin Halldorsdottir Eyfells has truly been an enriching experience.